Meldrum Bay, initially settled in 1876 is a former fishing, lumbering and farming community which has much of its original architecture. It is the first port of entry for boats coming to visit the North Channel from the United States. The village contains a customs office, docking facilities for cruising boats, a local hotel, fishing charters, a museum and a public park on the waterfront. A new causeway was recently built to protect the harbour and docks and it is a lovely place to walk out onto. A new marina/visitor centre was recently built and includes laundry facilities. While you can choose to relax and do nothing except enjoy the view, there is plenty to do in and near Meldrum Bay. This is an ideal location for nature lovers as there are lots of different species of birds at this end of the island, many deer and hares. You may see the occasional bear on the way to the lighthouse. 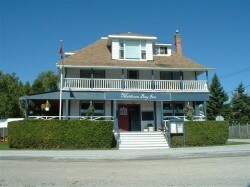 If it’s a warm night you might want to wander down the hill to the Meldrum Bay Inn (website www.meldrumbayinn.com), where you can go for a drink or enjoy the fine dining with wonderful views of the bay and surrounding hills. Be sure to make a reservation as the restaurant fills up quickly, especially during the height of the season in July and August. While at the Inn, you may end up talking to some of the boaters from around the Great Lakes. The Net Shed Museum is just down the hill from the cottage and is usually open during the summer time. It has a lot of artifacts from earlier settlers in Meldrum Bay many of whom were employed in the lumber and fishing industry. The Mississagi Lighthouse Heritage Park and Campground (website http://www.themississagilighthouse.com) is another point of interest you won’t want to miss. 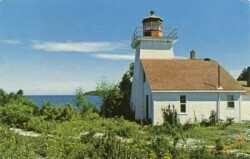 The Mississagi Lighthouse was built in 1873 as a lighthouse and fog station. The lighthouse overlooks the Mississagi Straight which separates Manitoulin and Coburn Island. It is believed that Lassalle’s ship, the Griffon, was wrecked near the lighthouse and that the crew died in caves along the shore. The lighthouse is operated as a museum and can be visited along with a restaurant that operates on the site. There is also camping on the park grounds. It is only a short drive (or challenging bike ride) from Meldrum Bay. The site is attractive to those who want to paint, take pictures, jump into the water or explore its unique flora and fauna. Cockburn Island - a short boat ride across the Missisaggi Straits from Meldrum Bay—makes a nice day trip. The island was settled in the late 1800's and at its peak the population may have exceeded 1,000 inhabitants. 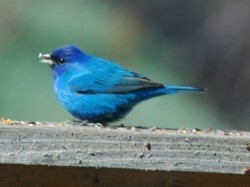 After World War II, a steady migration back to the mainland began, and now there are perhaps only two or three year-round residents. 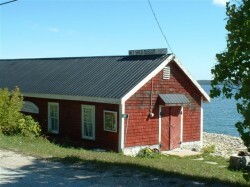 However, many former islanders use their old homes as summer cottages, and as many as 200 come to the island in July and August. To get to Cockburn Island, contact the Township of Cockburn Island for sailing times and details. Once on the island you can arrange a taxi to show you around. You may also want to bring bikes. If you like preparing your own seafood you can pick up fresh whitefish, trout and smoked fish from Purvis Brothers at Burnt Island near Silverwater. Whitefish from Purvis Brothers is shipped to many big cities such as New York, Chicago and Toronto. 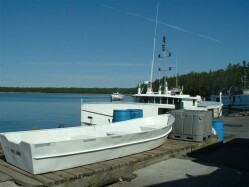 Besides the freshly caught whitefish, the trip to Burnt Island makes for a pleasant excursion. If you have an interest in native arts and culture, you may want to visit the nearby First Nations of SheShegWaning and Zhiibaahaasing. Visitors are welcome and the two communities are on the same road. 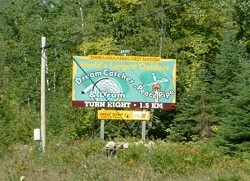 There is a store in SheShegWaning that sells native crafts, and Zhiibaahaasing is the home of the reputed world’s largest outdoor peace pipe and dream catcher.